1829 - William Dickinson builds first home in De Pere. 1836 - The Fox River Hydraulic Company is founded and began construction of a dam across the river. 1857 - The Village of De Pere is incorporated. 1870 - The Village of West De Pere is incorporated. 1883 - The Village of West De Pere changes its name to the City of Nicolet, after early voyageur Jean Nicolet. 1887 - The City of Nicolet becomes the City of West De Pere. 1890 - The City of West De Pere annexes into the City of De Pere. 1990 - The City of De Pere celebrates 100 years as a consolidated city. 2007 - De Pere celebrates the 150th anniversary of the incorporation of the community. 2008 - Time capsule buried that incorporate items representing the first 200 years of De Pere's history. There are many significant events in De Pere's early history. 2007 marked the 150th anniversary of the incorporation of the Village of De Pere. At the time, the west side and east side of De Pere were separate communities. The consolidation of De Pere and West De Pere began in the late 1880's when the communities needed a new bridge. De Pere, which had become a village in 1857 and then a city in 1883, was able to afford their portion of the costs. The City of West De Pere, which had begun as a village in 1870, changed its name in 1883 to the City of Nicolet, and then in 1887 became the City of West De Pere, could not afford their portion. There was much discussion and debate, but eventually the west side men voted to annex into the City of De Pere. That is what Celebrate commemorates - the union of the two sides. In addition to the 117th anniversary of consolidation, this year also marks the 150th anniversary of the incorporation of the Village of De Pere that later became the city it is today. 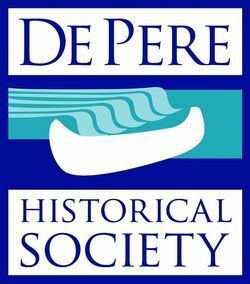 The De Pere Historical Society will be commemorating the sesquicentennial of our community beginning with an entry in the Memorial Day parade and a proclamation from the mayor afterwards in the park. Details about an essay and art contest for students and the burying of a time capsule will follow soon. Here is the history of how De Pere, both east and west sides, became the great community it is today. Over two decades before the incorporation of the Village of De Pere, General William Dickinson, Charles Tullar and John P. Arndt were granted authorization from the Legislative Council of the Territory of Michigan “to erect a dam across the Fox River at the Rapids De Peres for the purpose of erecting mills or any other industry to make use of the water power and build wharves, warehouses and other buildings either above or below the dam.” Their partnership formed the Fox River Hydraulic Company in September of 1835. That company built the first dam to use the rapids of the Fox River for water power. Seven months later, on April 20, 1836, Congress created the Territory of Wisconsin, from the Michigan Territory, which at the time was also made up of the states if Minnesota, Iowa, and parts of the Dakotas. During the first legislative session of the new Territory, Act 18 was passed that established the names of three towns in our area. The first town was Alexander. It was located "on the west side of Fox River, between Depere and Grand Chute, be and the same is hereby set off into a separate town by the name of Alexander; and the polls of election shall be opened at the house of Grignon, at the Grand Cachalin." The next was Green Bay, which was defined as "all that country, north of the town of Wilcox, be, and the same is hereby set off into a separate township by the name of Green Bay; and the polls of election shall be opened at the schoolhouse in Navarino." The third town was Wilcox and encompassed "all that country north of the township line between towns twenty and twenty-one, and south of the township line, between towns twenty-three and twenty-four, be, and the same is hereby set off into a separate town by the name of Wilcox; and the polls of election shall be opened at the courthouse at the house of John Lawe." Around that same time, the stockholders of the Fox River Hydraulic Company hired Albert G. Ellis to survey and plat the lands of William Dickinson and John Lawe. That plat would become the Town of De Pere, and replace the Town of Wilcox. That plat was recorded with the Register of Deeds on November 16, 1836. Principles of the Fox River Hydraulic Company, included men now synonymous with early De Pere and Brown County history: John Lawe, William Dickinson, John P. Arndt, Alexander Arndt and Company, Morgan L. Martin, Charles Tullar, Joseph Dickinson, George Boyd, Ebenezer Childs, David Ward, James Doty, and George Lawe. The office of the Fox River Hydraulic Company still stands and is now known as White Pillars Museum and is home to the De Pere Historical Society. Over the next two decades, the little community that was De Pere, snuggled in dense white pine, oak and maple forests, began to flourish. People came for the opportunity this area afforded to own land, cut timber, build homes, dry-goods stores, and establish mills. Then on March 6, 1857, the State of Wisconsin approved the incorporation of the Village of De Pere. Chapter 276 of “Private and Local Laws passed by the Legislature of Wisc. in the year Eighteen Hundred and Fifty-Seven" describes the act to incorporate the village of Depere. The sections of incorporation include the expected establishment of boundaries, governing bodies and officers, elections, police, and superintendent of schools. It also included general powers of trustees to regulate things such as saloons, victualing houses, and persons dealing in spirituous, or intoxicating liquors, regulate the storage and keeping of gunpowder, prevent horseracing or immoderate driving or riding in the streets, and to regulate the places for bathing or swimming, restrain the running at large of cattle, swine, horses, sheep, geese and poultry, and prevent the running at large of dogs. Trustees were also granted powers to establish and regulate boards of health, provide hospitals, cemeteries, and regulate the burial of the dead, procure fire engines, buckets, hooks and ladders, prevent persons from riding, driving or leading any horse or other animal, on the sidewalks within the limits of the village, restrain drunkards or immoderate drinking, or obscenity in the streets, or any public place, regulate the of weighing hay, of measuring and selling wood, lumber, timber, lime and sand, and when necessary, to appoint suitable inspectors and surveyors to superintend the same, protect trees and monuments within the village, prevent the depositing within any waters of the village any dead carcass or filth of any kind. With the incorporation of the Village of De Pere, all government related ties with the Town of De Pere ceased on April 6, 1857. The next day, elections were held at the courthouse in De Pere, which was located on the northeast corner of Wisconsin and Broadway to elect a village president and a board of trustees. Before proceeding with the election, Justice of the Peace T. C. Morgan swore in the following election officials, Dominicus Jordan as moderator, Randall Wilcox as inspector and James T. Reeve as clerk. With those duties assigned, the first election of the newly incorporated Village of De Pere was held for the eighty-nine men eligible to vote. After the ballots were counted, Randall Wilcox was elected president and William Field, Jr., John O. Roorbach, T. C. Morgan, John F. Lessey, Gustavus Marsh, and E. C. Merrill trustees. Other positions filled included assessors Dominicus Jordan and William Wakeman, Justices of the Peace William Wakeman and A. R. Martin, constables, William Armstrong and A. H. Davis, and John F. Lessey as superintendent of common schools. A few days later on Saturday, April 11, the President and Board of Trustees carried out their first order of business, in which James T. Reeve was appointed clerk, William P. Call, marshal, and Joseph Keiper, treasurer. From that point forward, the Village of De Pere established its own identity. It grew and prospered to become the City of De Pere twenty-six years later in 1883. De Pere celebrated the semi-centennial during 1907 in a variety of ways, including a reunion of those who lived in De Pere and near-by vicinity when the community was incorporated in 1857. Mayor John Cook issued the following proclamation. "Next Saturday, March 9, 1907, being the fiftieth anniversary of the incorporation of the village of Depere, I, John Cook, Mayor of this city of De Pere, do hereby proclaim that in commemoration of this anniversary, on next Saturday the national colors shall be displayed from all public buildings, that at 12 o'clock at noon and at 6 o'clock in the evening steam whistles shall be blown and bells shall be rung for from five to ten minutes, that all person who were residents of De Pere or its immediate vicinity, at the time of said incorporation, shall, at 6 o'clock on the evening of that day, gather at the Opera House where a banquet shall be tendered them, and that all citizens of De Pere shall assemble there at the same hour to take part in the Semi-centennial exercises arranged for that occasion. Let all turn out and give the pioneer settlers a rousing reception. John Cook, Mayor." An informal program of songs, speeches and reminiscences, followed a special picnic supper for early residents of De Pere. Benjamin F. Smith and James W. Childs spoke about early manufacturing and mercantile businesses of the area. Dr. Andrew C. Mailor and Paul Scheuring shared their memories, a double-quartette sang songs, and the local Badger Band played a few numbers. William P. Call, age 92, the first marshal of De Pere, acted as honorary marshal for the event. During the evening, a roll call of the first village officers was read by C. G. Wilcox. Trustees: William Field, Jr. - died at De Pere, Oct. 21, 1883; John O. Roorbach - living at Groton, Conn.; T. C. Morgan - died at Washington, D.C., July 16, 1871; John F. Lessey - died at De Pere, Nov. 20, 1879; G. S. Marsh - died at Oshkosh, June 12, 1897; Edwin C. Merrill - died at De Pere, March 16, 1905. William P. Call, village marshal - Mr. Call arises from his seat and answers, "I'm here," upon which City Marshal Shea vested him with uniform and star. That commemorative star is now in the possession of his great-great grandson, Patrick Call of Milwaukee.